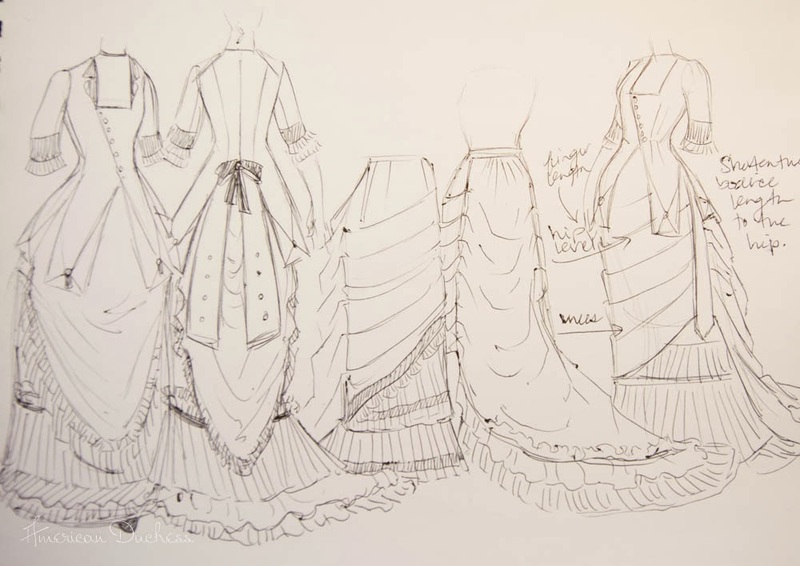 Last night, I jumped into working on this 1879 gown, for our tea on December 14th. 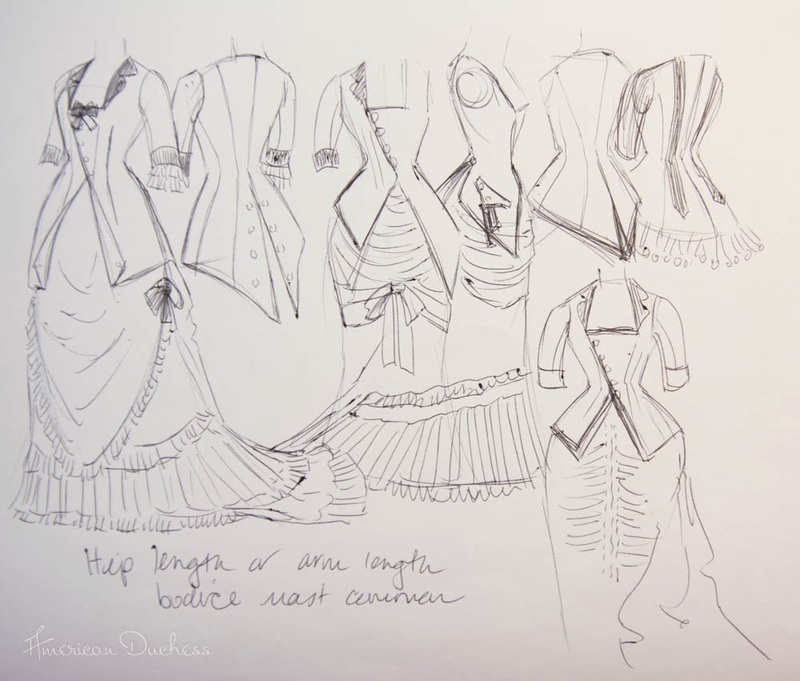 I was so anxious to see what resulted from the Wearing History 1879 Dinner Bodice pattern, as the pattern only has one illustration showing the front of the bodice, and I was just dying to know what was going on in the back. The pattern went together quite nicely. The measurements are accurate, and I found the pieces quite true. The pattern notes that the center back pieces, at the hem, are longer than the rest of the bodice hem, which I suspect was a purposeful design, as the rest of the pieces match so cleanly. I hit a snag with the pattern where the revers are concerned. 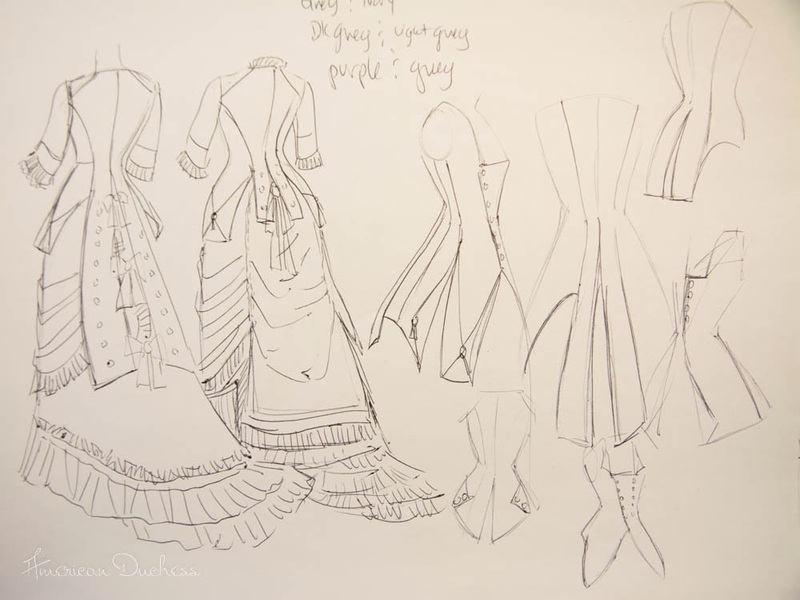 The illustration shows these lovely little turned back bits on the lower edge of the bodice, but when I turned back my bits, according to the lines on the pattern, it didn't look at all like the illustration. I fiddled for many hours, until I determined that the bodice overall was too long for my taste, so I went slicing n' dicing, and cut the bodice hem into a shape I liked and felt would be more flattering on me. At this point I thought it would be a good idea to get jiggy with the skirt. 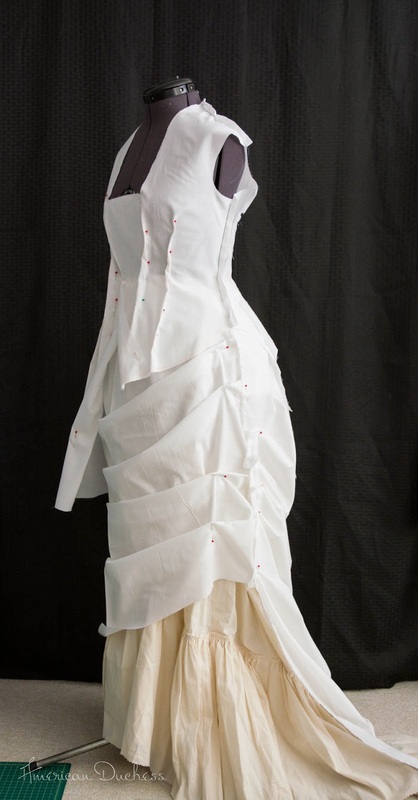 I had no idea what I was doing, but after consulting Patterns of Fashion 2 , and Jen Rosburgh's "How to Make an 1870s Bustle Skirt" post, I set to work pleating and pinning kindof just wherever. Skirt swags, along with the bodice back - on the left, the altered line (which may be altered further), and on the right the original lines. Oddly enough, it appears to have worked. 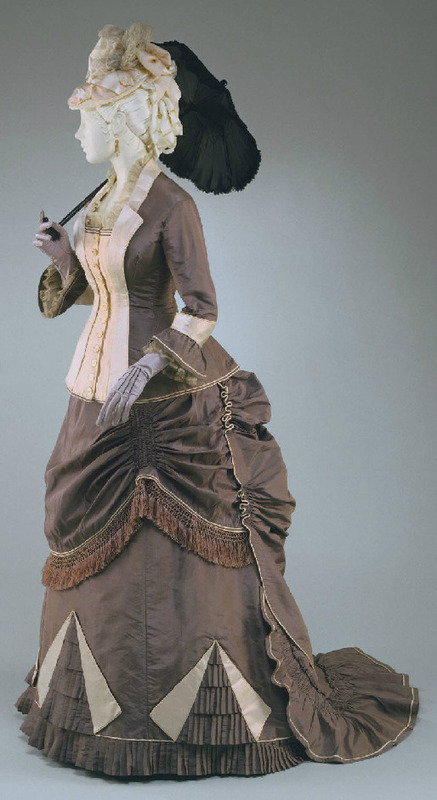 I wanted that tight-across-the-front, flared-at-the-bottom late 1870s look, and for the bodice to work with the placement of the poufs. I think it kindof looks like an insect body at the moment, so I may try a couple different methods of gathering up the sides, before deciding on the final design. ...but it's as much random chaos as anything right now! 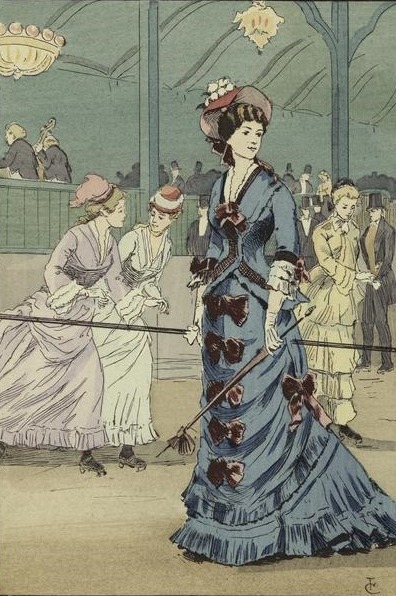 I LOVE that grey dress in the fashion plate. The little bows are just so delicious! I would make them pink, though. 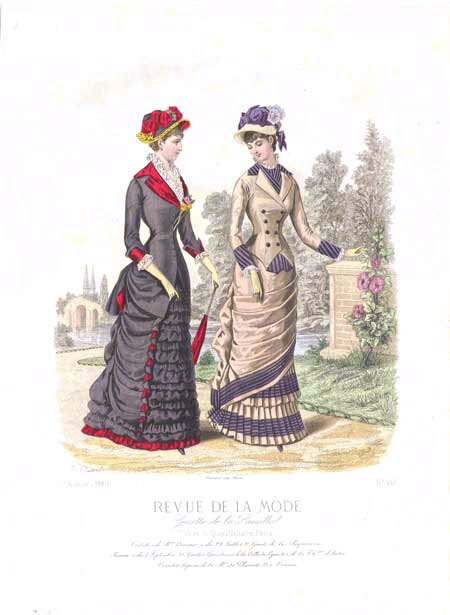 Your draping is looking magnificent (I love the 1870s deep square neckline), and I am exceptionally jealous. 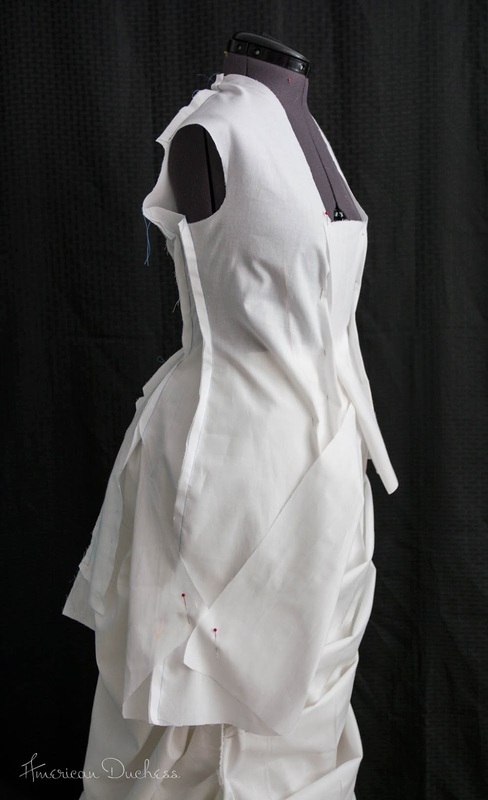 Maybe you could run with the "insect body" thing and make one of those operatic beetle wing dresses. I just love your sketches! I am amazingly jealous of your artistic ability! What are you using as foundation garments? Did you use a very small bustle or is the skirt just standing out like that on its own? OMG, you just inspired me to pull out a rose changeable silk taffeta I've had fermenting for a few years! Ooo, love the revers on the back of the bodice! Well, we'll be close in time. 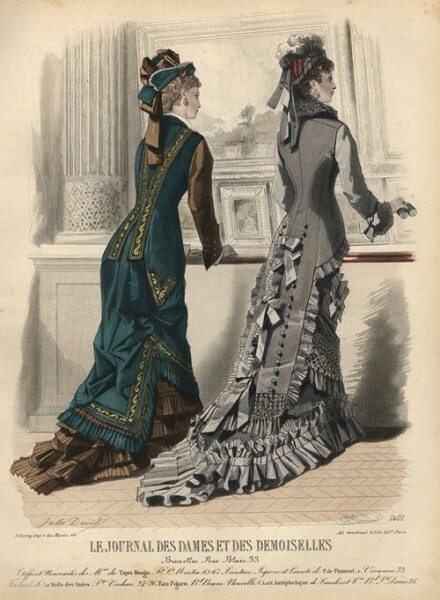 I just ordered this pattern from Truly Victorian: http://www.trulyvictorian.net/tvxcart/product.php?productid=42&cat=2&page=1 along with a bustle and a petticoat pattern. I'll have the two weeks before to work on it. Until then, it is ramp up for the show I'm doing Thanksgiving weekend. Anyway, two years apart in time, very different silhouettes! Can't wait to see what you do. I don't think you could go wrong with any of those sketches!